Varied field pattern resulting from enclosure of common open fields associated with ridge and furrow and former medieval manorial centres and late enclosure of areas of common grazing, 'green' encroachment settlements and remains of two large US Army hospitals and subsequent Polish hospitals. Early settlement of the area is suggested by Anglo-Saxon and Welsh place-name evidence indicative of early medieval and medieval woodland clearance. Penley, first recorded as Pendele in 1300, derives from the personal name Penda and the Old English element -leah meaning 'wood, clearing in a wood' which is also rendered in the Welsh place-name Llannerch Panna which has the same meaning. Lightwood Green, first recorded at 'Lightwoode' in 1484, includes the Old English leoht 'bright, light'. Medieval settlement is represented by the Penley moated site which probably represents a manorial centre of the later 13th or 14th century. Open field strips in the township of Llannerch Panna are documented in the later Middle Ages though it is probable that as elsewhere in Maelor Saesneg these medieval common fields were being enclosed and absorbed into the expanding landed estates that are in evidence by the early 16th century. In the post-medieval period the moated site at Penley was replaced by Penley Hall, the focus of an estate owned by the Dymock family, Llannerch Panna becoming the site of a country house for a branch of the Kenyon family in the late 19th century. During the course of the Second World War to US Army hospitals the parkland associated Penley Hall and Llannerch Panna, which in the post-war years were reused as hospitals for Polish refugees. The area occupies an area of undulating farmland between about 30-70 metres above Ordnance Datum, gently sloping to the north, dissected by wooded stream valleys which feed the Emral Brook. Field patterns are dominated by large and small irregular field boundaries, with an area of strip fields in the Park Lane and Street Lydan area, though the widespread occurrence of ridge and furrow cultivation within the character area probably indicates the former presence of medieval open field cultivation which is not clearly represented in the field pattern. Numerous marl pits are scattered throughout the area, many represented by ponds. Modern land use is predominantly pasture, fields being bounded with multi-species hedges with scattered mature oak trees in the hedge lines. A more ancient settlement pattern is represented by quite scattered farms, the present settlements at both Lightwood Green and Penley, despite the early documentation of their place-names, being predominantly the creation of the 18th to 20th centuries. The tithe map of the 1830s shows Lightwood Green as an already well developed 'green' settlement probably encroaching upon a former area of common grazing, with a cluster of dwellings in individual small enclosures around an central green with several other encroachments at its centre. The central common identifiable on the tithe has largely disappeared with the development of the brickworks, and the modern timber yard. The commons here were not enclosed until 1877, being one of the latest enclosures of common land in the country. Between the late 19th century and the 1960s the settlement benefited from the Wrexham and Ellesmere Railway, provided with a station at Lightwood Green. The Overton Brick and Tile Works at Lightwood Green began in the late 19th century and closed during Second World War, produced bricks, pipes, coping blocks and window sills. At the time of enclosure at the end of the 18th century the pattern of settlement was evidently quite dispersed, though the association with the place-names 'Big Green', 'Little Green' and 'Far Green' and 'Chapel Green' again suggests that the settlement had its origins in the gradual enclosure of former areas of common grazing which were once more extensive. Penley remained a dependent chapelry of the parish of Ellesmere until 1869, when it became a parish in its own right. The enclosure award shows Penley chapel (now the parish church) lying close to Chapel Green, an irregular area of common at the junction of Holly Bush Lane and the A539 around which were grouped three houses on the south side of the road and another four beside or close to Holly Bush Lane which led to Little Green. A little further eastwards was the much larger Far Green, now bisected by the main road, with a scatter of dwellings around its edge and Penley Hall to the north. The settlement remained relatively small until the creation of the military hospital during the Second World War. Few early buildings or structures remain visible within the landscape within the area, the earliest building horizon being characteristically represented by the brick-built late 17th-century farmhouse at Penley Old Hall concealing the remains of a 16th-century timber hall, probably of two bays and open to the roof, whose high status is emphasised by the decorative motifs painted over the timber and plaster interior, including what appears to be a trompe l'oeil wall torch set in a bracket. The mid 18th-century farmhouse at Lightwood Hall may likewise have been built around the core of an earlier building. Perhaps characteristic of agricultural buildings rarely surviving in the area today is the originally cruck-framed barn, dating from 1550, which once stood at Street Lydan, now re-erected at the Museum of Welsh Life at St Fagans. Buildings of the late 17th-century onwards were almost invariably brick-built, as at Penley Old Hall and Lightwood Hall as well as a number of more modest farmhouses and dwellings. The area was associated with three local estates which grew to prominence particularly from the early 17th century onwards, including the Dymocks of Penley and the Pulestons of Emral. The 1870s country house at Llannerch Panna (renamed Tudor Court), in vernacular style with external walls of half-timber and Ruabon brick chimneys was built for a branch of the Kenyon family. Other distinctive modern buildings in the area include the Madras School in Penley, built in 1811 (named after a school in where one of the founders had worked), of stuccoed brick, thatched in cottage orné style. 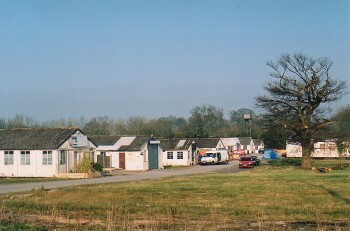 Buildings and structures associated with the US Army and subsequent Polish hospital at Penley Hall survives, though parts are now occupied by the Penley Industrial Estate or Enterprise Park, other parts, like the similar establishment at Llannerch, having been sold for private and local authority housing.